The picturesque fishing village of Sayulita Mexico offers visitors and residents incredible beaches, lush jungles and a taste of rural Mexico. The Central Pacific Coast of Mexico is surrounded by jungle and receives 345 days of sunshine per year. Located on the same latitude as the Hawaiian Islands, its sub-tropical climate is often compared to Hawaii’s. Temperatures reach 90 degrees F (32 C) during the summer, along with high humidity, but at night, the onshore breeze from the Bay of Banderas brings cool air that makes for pleasant sleeping conditions. The rainy season is June through September, however, August and September are considered the two “rainy” months. 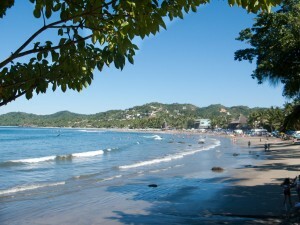 Sayulita is famous for its right reef break, popular with longboarders. There is also a left reef break in front of the campground. The southern end of the beach is an ideal spot for beginners because of the sandy bottom. There are numerous breaks in the area, most under 20 minutes away. The waves are perfect for all skill levels including beginners (first time), intermediate, and advanced surfers. Waves can break in the bay all year round with the best months being December through early April, as that is when the north swells hit. Surfers were some of the first foreigners to visit Sayulita in the late 1960′s where they found warm water and consistent waves all year-round. To this day, the Sayulita surf breaks and waves have fulfilled the tropical surf dreams of beginner to advanced surfers from all over the world. There are two surf spots in Sayulita; a right (longboard) break in front of the village and a left (faster) break in front of the campground. Surfboard rentals can be found at a variety of locations on the beach in front of the right break. Surfers may want to bring a 1-2 millimeter rash guard for the early morning breezes in December through March but a wetsuit is rarely needed. The closest airport is the Puerto Vallarta International airport (PYR). Sauylita is about 45 minutes from the airport. If you are arriving from the United States, there are some cheap charter flights available. From overseas, the possibilities are to land in Mexico City or Guadalajara and then catch another flight to Puerto Vallarta. 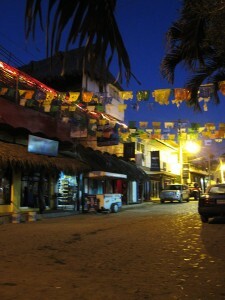 Guadalajara is close to 4 hours from Sayulita. LadiesCamps have pitched our tent on Sayulita beach. Photo aokettun displayed under CCPL. LadiesCamps enjoy nigh-life as well as surfing. Photo Zaskoda displayed under CCPL. LadiesCamps' Camp Director Desiree Bilon.